This tiny home on wheels is a modern take on those wonderful gypsy wagon one still sees its of Europen par. This one’s used as a great getaway space. It’s whimsical and unique and hard not to fall in love with. Whether it’s your style or not, it’s certainly integrates with the sights and sounds that this nature-rich site provides. The compact space has everything you’ll need to live comfortably. When nature calls there’s a nearby composting toilet in an outhouse. There’s also a cast iron clawfoot bathtub. Fresh water is supplied by a nearby spring. You can set it anywhere you want as it is on wheels and can be towed by truck or tractor. It can be used as a tiny home, a weekend cabin, or even as a home office if you choose to set it in your own yard. 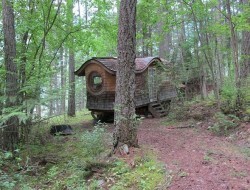 Could you live in a gypsy wagon?